Bristol isn't ever going to struggle for good places to eat. From gastro to pub grub, the city is stuffed with nice spaces to tie on a nose-bag. On our visits to the city by the sea, I've always been impressed by the range of fab eateries on offer and their increasing focus on local provenance. One of the best recent examples of that philosophy has been, of all places, a pizza joint. The Stable is part of a small chain of restaurants dotted around the south-west with a pretty unique USP. 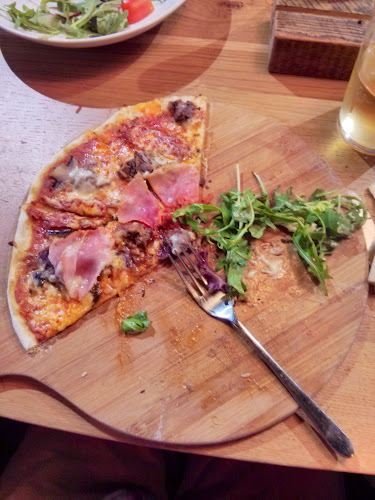 They've come up with a food and drink pairing that I'd never considered–pizza and cider. After a lunchtime visit, I'm a convert to the cause. I mentioned provenance, and The Stable is dead serious about sourcing locally. The all-important crust is a sourdough made from organic British wheat. The meat and seafood falls well within locavore metrics, and the huge range of ciders and perries is all from the lower left of the country. They offer drinks by draft, bottle and mini-keg with a limited range of beers and wines and softies. The staff are friendly and knowledgable, affably offering me a couple of tasters to help me make up my mind. Cider and pizza? Well, yeah, think about it. A beer with your margherita is a big wallop of wheatiness that'll leave you with a fat dose of bloat. Cider doesn't give you that, and you consequently find the food much more digestable. The lighter, crisper flavour just seems to cut through the richness of the toppings with a cleanliness that beer or wine simply can't. It's a deliciously logical pairing. Pictured, my Longhorn Jim, approximately 15 seconds after it hit the table. The pizzas are thin-crust and loaded with goodies, firing out with admirable speed from a brace of hefty wood-fired ovens. The generosity of the topppings means the most sensible option from getting the pizza into your feed hole is American-style: grab a slice, fold the pointy end over towards the crust and munch away. With my Longhorn Jim, heavy with ground beef, chorizo and ham (I'm a lapsed vegetarian, can you tell?) the crust was just strong enough to take the moisure from the tomato sauce and copious amounts of paprika-spiked oil to make it from wooden paddle to gob. TLC's Avonmouth Angler, though, was so heaped with smoked salmon and mackeral that she had to resort to a knife and fork. Mean while, DocoDom's Portishead Porker was every Englishman's dream: bacon, mushroom, tomato and a fried egg, breakfast on a pizza base. 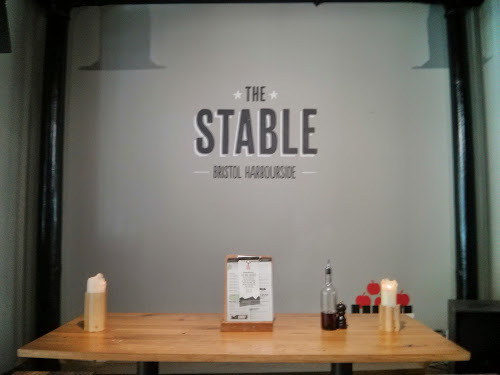 Already hugely popular of an evening, The Stable seems well on its way to becoming a bit of a Bristol favourite, calmly buzzy at half twelve on a Sunday afternoon. Unflappable service and great grub in a spot that puts you right in the middle of Bristol's shopping and cultural hub? Bit of a no-brainer, frankly. The four of us were more than happy: sipping, nibbling and considering how The Stable were putting a wryly British spin on the Italian classic. Much like Shakespeare, pizza stands up to pretty much any setting into which you care to place it.